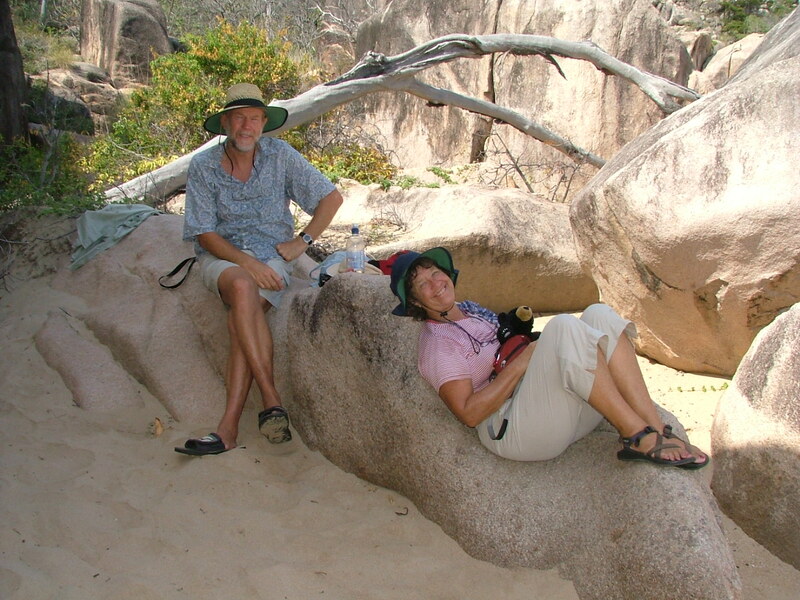 On Christmas Day 2006, Victor flew from Rockhampton, north to Townsville, while Barbara flew south, to Adelaide. 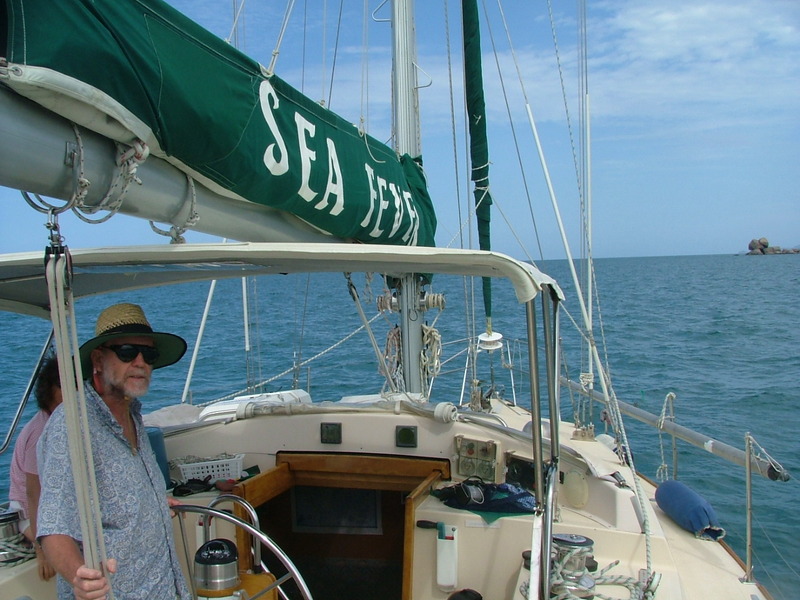 Victor spent 4 days on Sea Fever with (brother) Robert and Wendy, sailing around Magnetic Island. (To zoom any photo below to full size, just click it. Then press the back button to return to this page.) 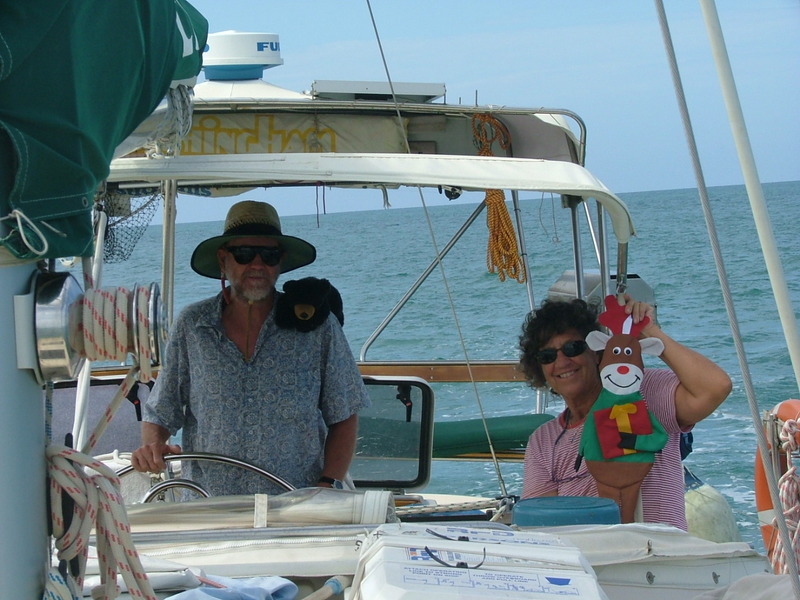 Wendy cooked a magnificent traditional Christmas dinner on board, and we enjoyed it whilst anchored just off the beach. We walked around the coast to explore some lovely coves, we swam in the sea, and had some great chats over the odd glass of great Australian red wine! 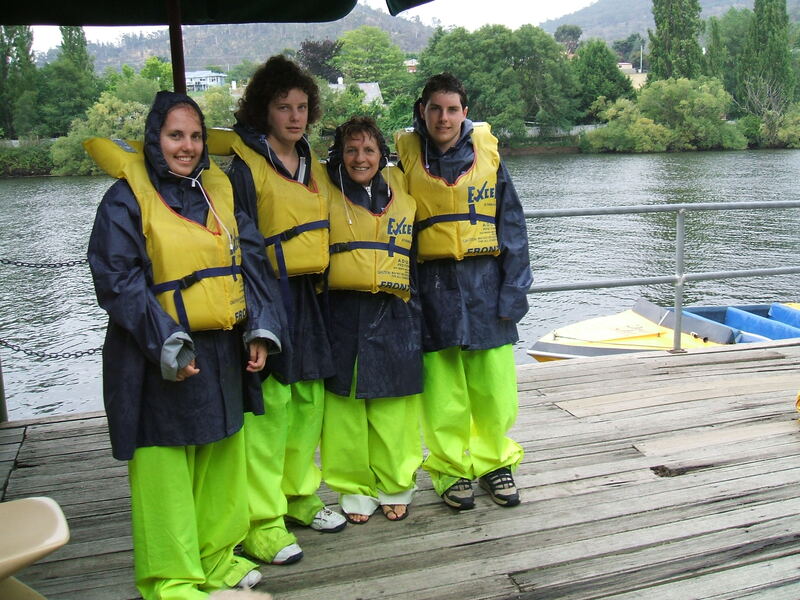 Barbara visited her family in South Australia, and took three of her grandchildren on a 5 day trip to Tasmania. 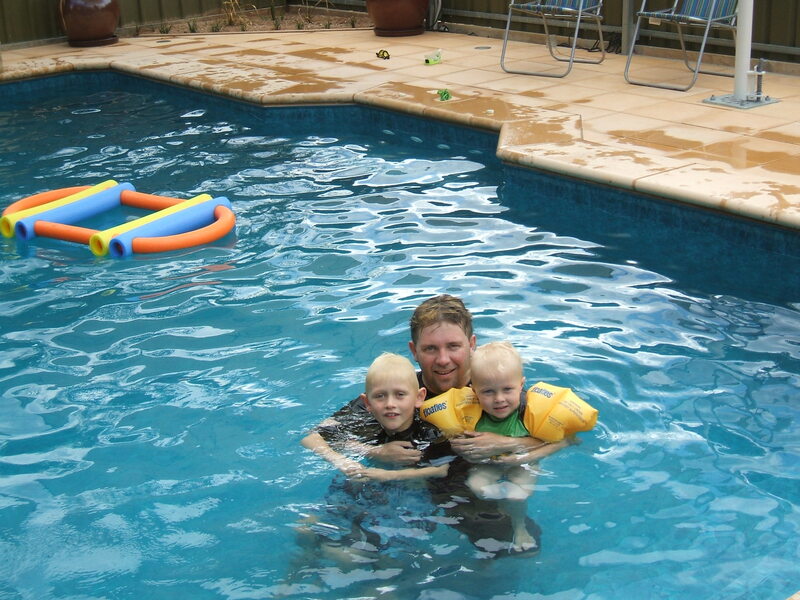 Daniel, Mason and Austin in their pool at home. Melissa, Cameron, Barbara and Paul, ready for their speed-boat trip in Tassie Samantha and Alex in their garden at One Tree Hill. Samantha playing her saxophone. 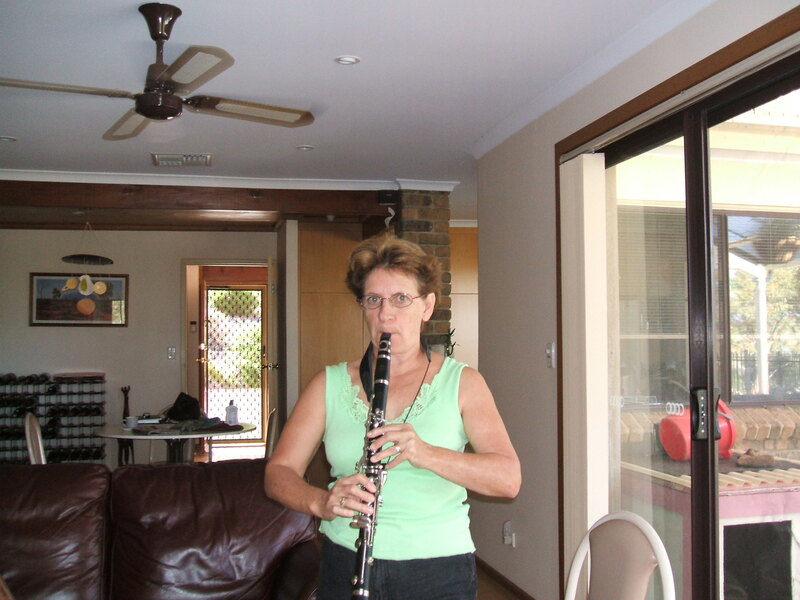 Barbara playing her clarinet, at the Glennie's house in One Tree Hill. During Barbara's absence in January 2007, back home in Yeppoon, Victor worked on his Musical Discovery software, and finished it just in time for Barbara's return home. In February he created a new branch of this web site to publicize the product, and to market it for $99 Australian dollars. Our neighbours did some tree-clearing, mainly intended for fire-breaks, but they certainly felled an awful lot of trees! One negative result is that we have a lot more wind, coming straight from the sea to our south-east, but one positive result is that we now have a view (should I rather say, a glimpse?) 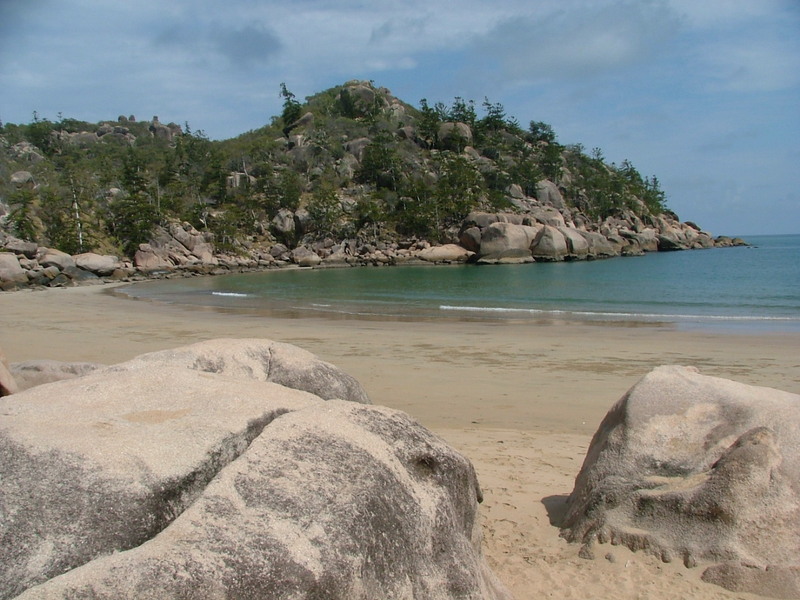 of the coast and of Great Keppel island. If you click on the thumbnail photo you can enlarge it. The picture was taken with the camera on almost maximum zoom. The Rockhampton Chamber Music Society (RCMS) resumed weekly meetings and monthly concerts in February, after the summer holiday break. Barbara and Victor usually both attend the weekly meetings, where we play piano duets or accompany other soloists or small instrumental groups. We enjoy music-making in small chamber groups a great deal. 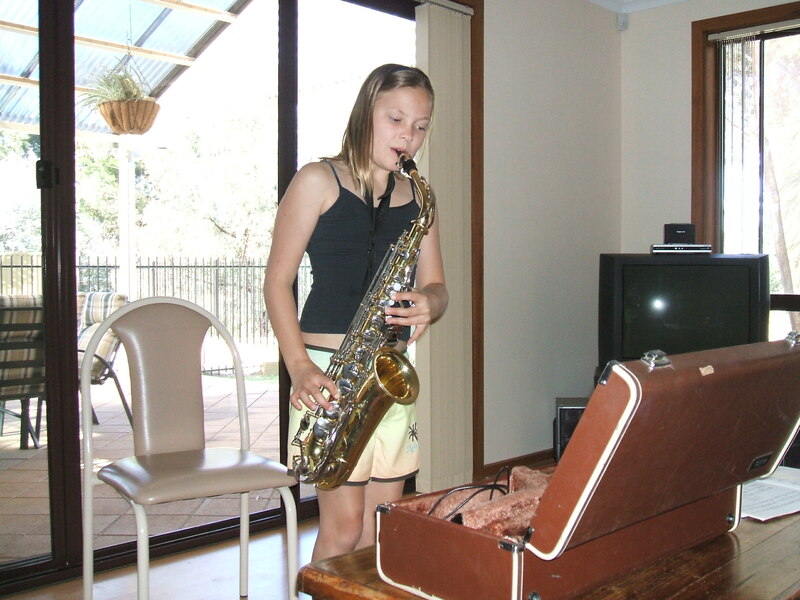 Barbara has progressed very fast in her clarinet playing, as she is extremely keen, and practices solidly every day. She plays clarinet with a young girl clarinettist at the RCMS meetings. 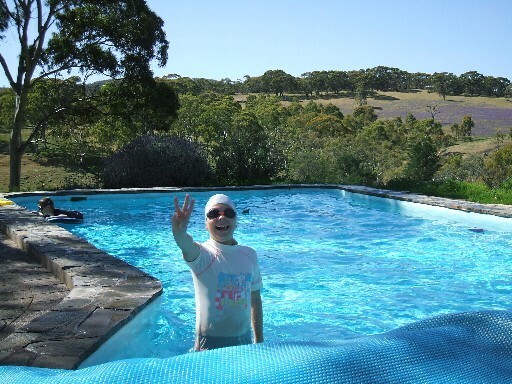 In March, Victor's daughter Karen came to Yeppoon for a 5-day visit. 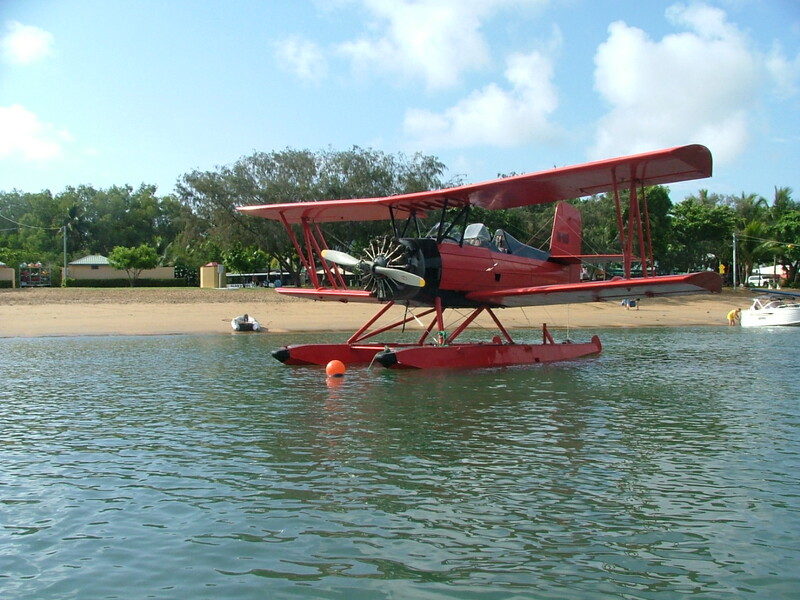 We had several delightful lunches and dinners at various restaurants in the district, including the Keppel Bay Sailing Club, whose decking overlooks a magnificent stretch of Yeppoon Beach, and over the sea to Great Keppel Island. 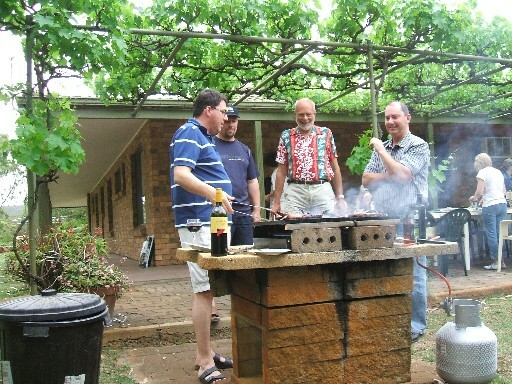 We also enjoyed a traditional Aussie BBQ at home. On her last day, a Sunday, we went to the RCMS concert, after which, sadly, we had to take Karen to the airport for her flight home to Brisbane. In May, Victor's brother, Robert, paid us a short visit. We saw a vivid stage performance of the musical West Side Story, in Rockhampton at the end of March, and 4 fabulous string players "The Australian String Quartet" performed there in April. 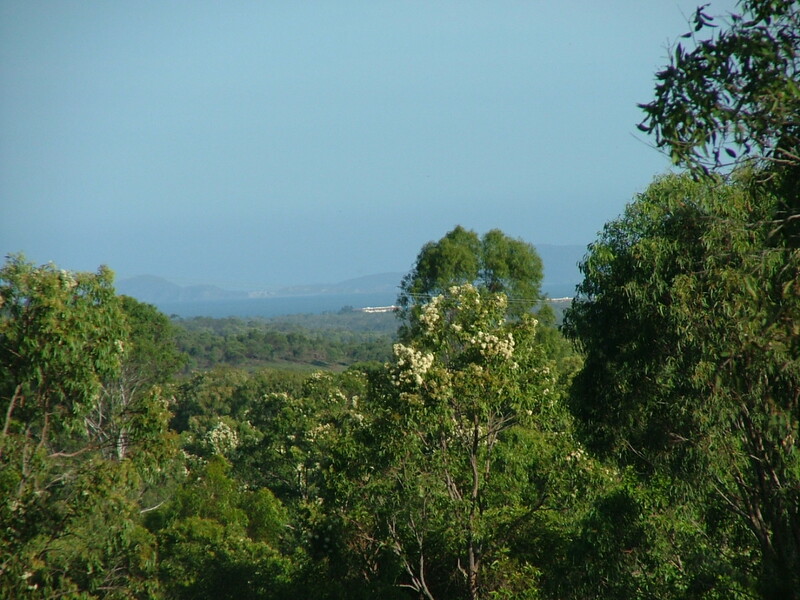 In June we visited Mackay to hear the Queensland Symphony Orchestra, and we also enjoyed a lovely day touring the Mackay hinterland in Eungella National Park. Also in June we say Prokofiev's ballet "Romeo and Juliet" at the Pilbeam Theatre in Rockhampton. In July the local Yeppoon Choral Society mounted a great production of the musical "My Fair Lady", and we also went to a Bell Shakespeare Company production of "Macbeth". In August we saw Jane Rutter (flute) and Simon Tedeschi (piano). We decided to move to SA to be nearer to Barbara's family, and so we put our house on the market in April. Our first contract was signed within a month but fell through, thereby delaying any sale by about 2 months. We finally sold the house with a settlement day of 29th August 2007, and drove south to Ipswich, where we stayed with Karen for a few days. Then we drove via St George QLD, Bourke NSW and Broken Hill NSW, to Adelaide SA, arriving at One Tree Hill on 6th September. We house-hunted in the Barossa Valley and the Adelaide Hills districts, and fairly soon we chose a 16 acre country property near to One Tree Hill. Our house from the front. The rain-water tank on left is our only water supply. We moved in on 28th September. 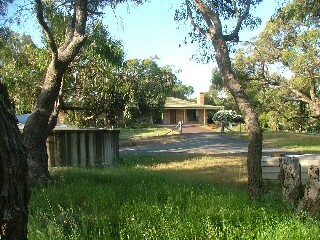 The property was beautifully green, with spring wild-flowers growing under the lightly-spread out gum trees. Our bottom Paddock. 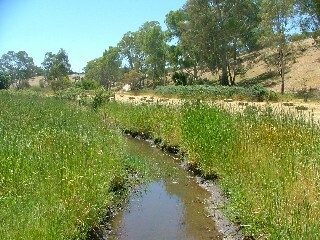 There is a brook (or creek in Oz) flowing through the bottom paddock, where the grass is especially tall and verdant. The greenness lasted right up to mid-November, and the weather was cool and very pleasant. We had to light the wood-burning combustion heater on many chilly mornings. Our brook has nearly dried out and the bottom paddock has been cut to hay. 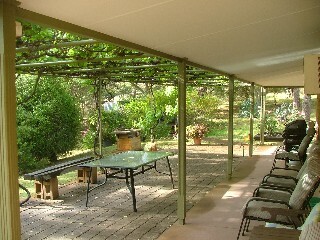 Our patio and BBQ area on the western side of the house is a great place from which to watch the sun go down. 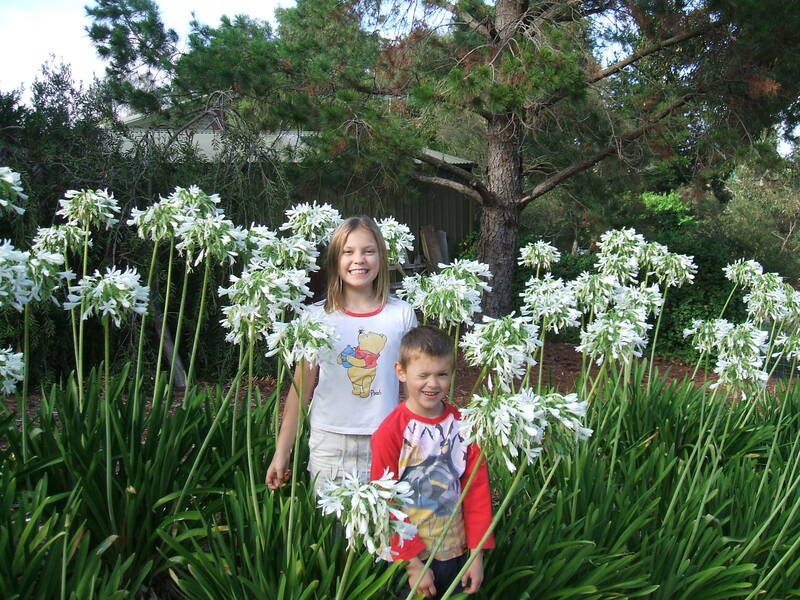 Just after moving in, in October we went to Kangaroo Island for a week's holiday with the Glenie family. Here is a seal at Admiral's Arch on the western tip of Kangaroo Island, in Flinders Chase national Park. 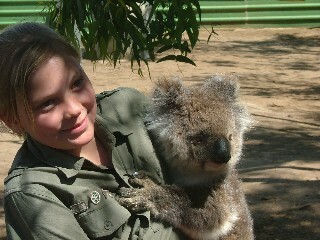 Sam Glenie (Barbara's grand-daughter) cuddling a koala at Paul's Place in Kangaroo Island. Suddenly in December the weather became extremely hot, in the mid 30s. The grass rapidly turned to a dry, yellowish brown colour, and our brook dried up. We had the bottom paddock cut to hay, yielding about 120 square bales. We agreed with one of our neighbours to have 3 of his cows on our property, to keep the grass down a bit. In December, Barbara's family organized a fantastic "surprise" birthday party for their mother. It was held at her son Daniel's place. It was great to see the genuine look of enormous surprise on Barbara's face when she saw the whole clan after walking in the door. Not only were all her children and grandchildren there, but also her 3 sisters and their husbands. The Glenie family stayed with us for about 3 weeks up to Christmas. On Christmas Eve we had a huge gathering of Barbara's family at our place, 21 people in all. 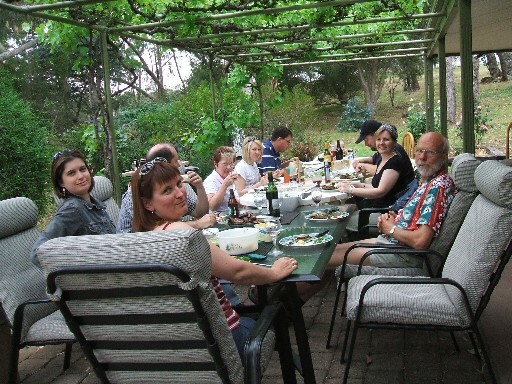 Then we spent Christmas Day at home with the Glenies.